FREE SHIPPING TO UK MAINLAND! The Reveal XR comes with an improved frame rate of >15Hz, for a faster image display. The Reveal XR is designed for long distance thermal detection, boasting a detection range of up to 275m and a 20° field of view. Easily transportable, small enough to fit in a pocket, and comes with a waterproof case for extra protection. 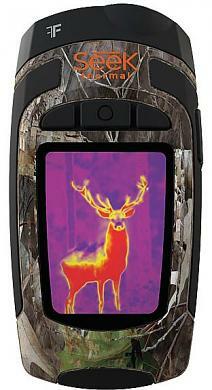 Its rugged shape and Camo rubberized casing also adds to its protection as well as its durability. A good choice for hunters and outdoor enthusiasts. With a broad colour palette consisting of 7 colour options this allows the user to tune the device to their own specific needs. Equipped with a powerful 300 lumen LED tourch built-in with full brightness control and a user friendly interface with a start-up time of less than 3 seconds the Reveal XR is a welcome addition. Users are also able to use the Reveal XR handheld thermal imager day or night with no change in functionality, and can capture photos straight to a micro SD card.